Amazon Echo Show 1st Generation and Amazon Echo Show 2nd Generation give the listener some insights into the developments taking place in the smart home operation. 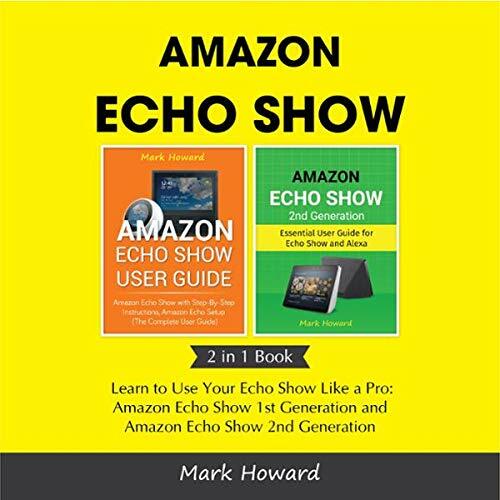 These audiobooks review the use of Amazon Echo Show and Alexa. Here, you can find descriptions, speculations, features, advantages and disadvantages, and strengths and weaknesses of the Amazon Echo Show. You will also find comparisons of different Amazon Echo products and structured analysis of different aspects. By the time you complete the audiobook, you will understand where the world is heading in terms of smart technology and the reasons why you should not be left behind as things change. Features of Echo Show like services, voice system and overview of operability etc. Technical details with technology used to create this product. Tips, tricks and hacks to use this device. How you can use Echo show as your personal assistant. How you can automate your household devices such as lights, garage door, coffeemaker, etc. What this product can do for you. How can you automate some of your day to day activities using Echo show. Plan your day using Alexa, i.e. alarm, to do list, calendar, playlist, videos streaming, video and calls, messaging, announcements, drop in, etc. How to become an expert at using Echo show. What users are saying about this product. What is coming in near future and enhancements. Description of Amazon Echo Show 2nd generation. The many uses and skills of Alexa. The strengths and weaknesses of Echo Show 2nd generation. Reasons why you should get the 2nd generation Echo Show. Structure comparisons of Amazon Echos. Tips on how to use Echo Show. Tips on how to use Alexa.